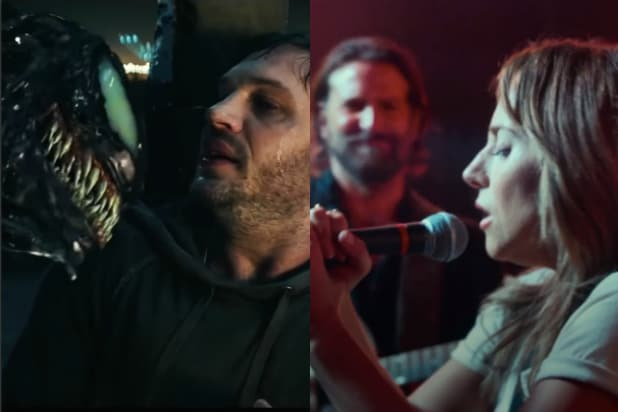 While October has been a releasing ground for some hit award winners and minor blockbusters, it has never had the box office jolt that Sony’s “Venom” and Warner Bros.’ “A Star Is Born” might provide this weekend. The opening weekend record for October releases currently belongs to the Oscar-winning 2013 Alfonso Cuaron space film “Gravity” with $55 million. The largest combined gross for an October weekend is $142 million, set during the opening weekend of “The Martian” in 2015. Both those records could be broken this weekend. “Venom,” Sony’s Spider-Man spinoff based around the web-slinger’s man-eating nemesis, is projected by the studio to match the opening of “Gravity, while independent trackers are expecting a new October best of at least $60 million, with one tracker going as high as $70 million. On top of that, “A Star Is Born,” which has earned critical acclaim from its premiere at the Venice Film Festival and is sure to bring in Lady Gaga fans in droves, is expected to gross at least $30 million, as $40 million is within the realm of possibility if the love this film has earned from critics grows into word-of-mouth raves from early audiences. Combined, the two films could drive movie theater business to levels never before seen in mid-autumn. For Sony, “Venom” is the start of a plan to launch a whole wave of Spidey spinoffs into theaters, something that the studio has planned since making a deal with Marvel Studios to add Peter Parker to the Marvel Cinematic Universe. While a $60 million opening isn’t big compared the incredible box office heights the MCU has reached in recent years, it would be comparable to that franchise’s earlier installments, like the 2011 films “Captain America: The First Avenger” and “Thor,” which both opened to $65 million. Also, “Venom” doesn’t have the massive budgets of Marvel Studios films, which nowadays fly well above $150 million. “Venom,” on the other hand, has a net production budget of $100 million. Still expensive, but relatively cheaper than the cost of most superhero movies. With a projected global launch of $160 million, the film should turn a profit for Sony, though how much of a profit will depend on whether critical and audience reception will sustain interest in the film against the likes of “Halloween” later this month. If reviews and reception for the symbiote antihero turn sour, “Venom” could face a sharp drop in grosses in much the same way “Suicide Squad” did two years ago. “Venom” stars Tom Hardy as Eddie Brock, a down-on-his-luck journalist who tries to revive his career by investigating the mysterious experiments being conducted by the Life Foundation and its shady leader, Carlton Drake (Riz Ahmed). “Venom” may draw male audiences away from “A Star Is Born” this weekend, but Bradley Cooper’s remake of the classic Hollywood tragedy is still expected to have a long life at the box office. With a 95 percent score on Rotten Tomatoes and strong chances of being a major Oscar contender, the film should get a strong mix of younger Gaga fans in the early stages of its run, and the prestige crowd and older moviegoers could keep the film’s momentum going well into November. 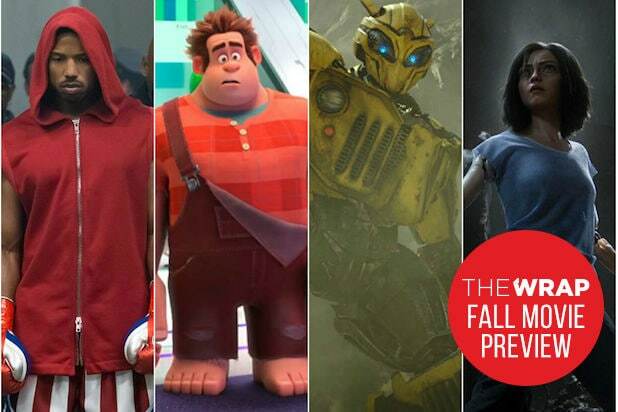 October has been a launch point for many awards contenders that go on to post a strong followup-weekend grosses at the box office. “The Martian,” for example, opened to $54 million and legged out to a strong $228 million by the time it got nominated for Best Picture. A year before, David Fincher and Gillian Flynn’s adaptation of “Gone Girl” opened to a modest $37.5 million, but went on to earn $167.7 million domestically and $369.3 million worldwide against a $61 million budget. “A Star Is Born” was even cheaper to make with a $36 million budget, so Warner Bros. should see yet another mid-budget hit in a 2018 that has seen the studio find box office success even without its most recognizable franchises. “A Star Is Born” stars Cooper as Jackson Maine, a famous yet fading singer-songwriter who has turned to alcohol. During his latest tour, he encounters a talented yet unknown singer named Ally (Lady Gaga), whom he falls in love with and helps propel to stardom. But as Ally’s career soars, Jackson’s continues to fall apart. Dave Chappelle, Andrew Dice Clay and Sam Elliott also star in this film, which is Cooper’s directorial debut.